Counting cards in blackjack: Can you count cards in online blackjack? Card counting is something that has reached almost mythical proportions within the casino community. There are numerous Hollywood movies devoted to the dark art. From Tom Cruise and Dustin Hoffman in Rain Man to Zach Galifianakis in The Hangover, many have turned to counting cards as a method of making a quick buck. But back in the real world, is it really possible? Can anybody do it? And, most importantly, is it legal? Clearly, if we can count cards there is a genuine opportunity to regularly outperform the house. That’s certainly an edge that most would be willing to gain. As the name suggests, card counting is simply the art of mentally logging each hand that the dealer has dealt in an attempt to predict the cards still left in the deck. This information will help you to decide a) if strong hands are likely to be upcoming, and b) the chance that the dealer can beat your blackjack hand. One of the key aspects of card counting is deck penetration, which determines how far the dealer is into the pack before they are shuffled and any counted sequences are rendered obsolete. Typically, a dealer uses a ‘shoe’ to house his or her cards, and will only shuffle once they are three-quarters or so into the deck; giving card counters ample time to make accurate deductions. In a normal game of blackjack, the casino has the house edge of 0.5%. If you can master card counting, this edge is said to switch to 1.0% in the player’s favour! Card counting requires exceptional numerical skills and memory. With that said, some casino visitors will be more effective at counting cards than others. In your head you will need to keep a running tally of the cards that have been revealed. One way to do this is to assign each a numerical value based on their actual number or perceived importance. For example, aces and picture cards are considered more important than mid-numbers, and their value reflects this. By maintaining this ongoing count, players can often predict when a flurry of possibilities will come their way based on the cards at the top of the dealer’s stack. This ‘Hi-Lo’ strategy is the most commonly used. 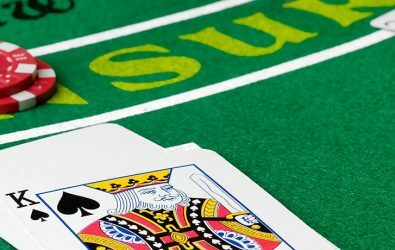 If carried out correctly, it can hand a player a unique advantage in understanding how a blackjack game will pan out. You will see some players modifying their bet amounts accordingly. They may base this on a hunch, but more likely is that they have been counting cards and suspect a higher percentage of face cards and aces to be dealt shortly. There’s a fine line here that we need to acknowledge. Card counting is *not* illegal, however, casinos consider it against the rules. Anyone found to be counting in a casino will be turfed out by security without so much as a second thought. If you are planning to count cards in Vegas or anywhere else for that matter make sure you are subtle about it! And that leads us rather nicely into the second part of this article: card counting while playing online blackjack. If there’s no security keeping tabs on you, then you are free to count cards as much as you like, aren’t you? While counting cards when playing online is free of detection, there are other obstacles that players must overcome. As we’ve mentioned, a key feature of card counting is deck penetration. This is based on the predictive movements of a real life, flesh-and-blood dealer. But what happens when the dealer is not real but an automated avatar? And what happens when the deck of cards is shuffled after each hand as happens at most online casinos? Obviously, counting cards in this scenario is a nigh-on impossibility. But one way that web-based casinos have looked to redress the balance is by offering their players a live casino environment. An example of this is a blackjack game manned by a dealer being filmed and streamed in real time. And hey presto: players can monitor deck penetration, allowing for more accurate card counting once again. So if there’s any advice to give to budding blackjack card counters, it is to play at a live casino table rather than the standard online variant. This is a great way to protect yourself from cheating too. You might not think it, but occasionally big online casinos have been found guilty of nefarious acts; most famously Ultimate Bet. This firm, who once sponsored the World Series of Blackjack, were found to be looking at the hole cards of their players using ‘God Mode’ software. This gave their dealers key information as to when to hit and when to hold. Russ Hamilton, Ultimate Bet owner, allegedly stole more than $50 million from his customers in this way. So the key takeaway point is this. No, card counting isn’t illegal, and yes you can use this strategy when playing online blackjack. Just make sure you play via one of the live casino channels. Doing so can maximise the efficiency of what you are doing.